AIMS Power inverters are the backbone of the world’s most versatile portable green-energy generator, which will be unveiled at EMEX in Reno, Nevada, Oct. 28-30. The AIMS Power green-energy inverter generator can produce up to 4000 watts of continuous electricity and 12,000 watts of surge for up to 20 seconds. Here at AIMS, we really pride ourselves on the customers we attract, because they’re doing things to improve their own lives and those around them. The Emergency Management and Homeland Security Expo (EMEX), an annual tradeshow put on by the International Association of Emergency Managers (IAEM), will feature AIMS Power as an exhibitor during the event at Silver Legacy in Reno, Nevada October 28-30. The company also plans to display and provide information about its extensive line of DC to AC inverters, which features more than 50 different models that come with 12, 24, 36 or 48 Volt inputs and generate anywhere from 75 to 12,000 Watts in the form of modified or pure sine waves. 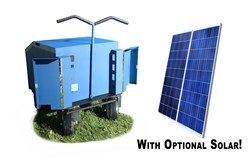 Amongst the most popular applications for AIMS Power inverters and renewable energy products is providing emergency electricity during disaster relief efforts. The company president and founder, Bruce de Jong, says his sales increase threefold during natural disasters like Hurricane Sandy, Hurricane Katrina and many others. Some of these customers include Princeton University faculty and students, who developed what they called the “Princeton Power in a Box” with a 5000 Watt AIMS Power inverter as the backbone. It is said to be the world’s first hybrid solar and wind generator, and everything it needs is fitted into a 20-foot shipping container. The system was designed as a disaster aid for the country of Haiti during a destructive earthquake in 2010, and it was deployed in Bermuda this past summer to help power the Atlantis Project at the Bermuda Institute of Ocean Sciences.